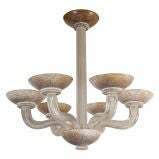 Hand blown 6-arm glass chandelier with scavo finish by Seguso (Murano Italy) for Karl Springer, American 1980s. These chandeliers are quite rare and this is a beautiful example of Springer’s luxurious design sensibility. 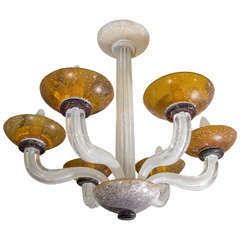 An elegant chandelier with six fluted curved clear glass arms supporting circular amber colored cups, fabricated for Karl Springer by Seguso, Murano Italy. American, circa 1980. 1980s Italian glass chandelier. Darkest at the top and the color gradually gets lighter towards the bottom. 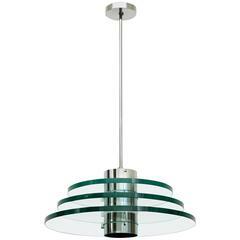 Imported by Lightolier with radiant glass rods and nickel-plated pierced steel plate. 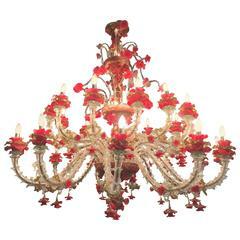 Beautiful Murano chandelier with 24-arms and a multitude of flowers in glass paste and gold inclusion.